Free Like the Wind is a fine art painting of running horses for sale by Kent Paulette. He painted this colorful modern art in the style of Cubism, Expressionism and his own creative style. Paulette captured the movement of the wild horses that are galloping from left to right. The color scheme of this equestrian art is mainly earth tones and neutral colors with pops of orange, teal, and yellow. This original abstract animal painting is made up of colorful geometric shapes. There is a lot of motion in these powerful galloping horses. 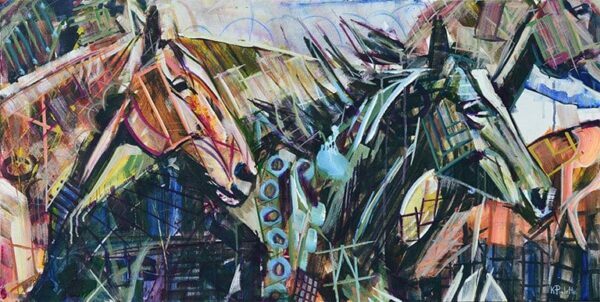 The dynamic brushstrokes give this expressive horse painting movement and a bold energy. The horses’ manes are blowing in the wind as they run. This painting of mustangs has vibrant colors that are bright and contrasting. The angular lines and organic shapes of this wildlife painting give the colts and ponies a modern look. Equestrian artist Kent Paulette painted this horse art in February 2015. Buy this contemporary art in small & large sizes on canvas. This abstract animal art is creative and people who go horseback riding love it. They can feel the power of these animals in the wild that are running free. Horses like this can be seen in nature, on a farm, or at horse racing events.